CAD Forum - How to find the map coordinate system of a drawing? How to find the map coordinate system of a drawing? 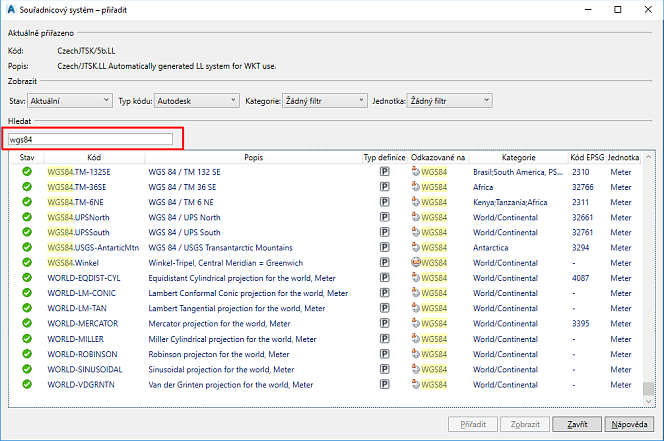 AutoCAD allows to select, assign and transform hundreds of frequently used mapping (GIS) coordinate systems from the whole world, by their name or EPSG code. This option in the status bar can be enabled in Civil/Map through the command MAPSTATUSBAR with its option Show/Hide. And in AutoCAD through the setting "GIS coordinates" in the hamburger menu "Customize" in the right down corner. This setting is stored in the Registry in HKCU\Software\Autodesk\AutoCAD\R23.0\ACAD-2001:409\Profiles\PROFILENAME\StatusBar\Application\GeoCoordSys (1/0). A similar function can be achieved (and also in plain AutoCAD) using the variable CGEOCS. Note: the variable GEOMAPMODE carry the current display mode of any map overlay from the online service Microsoft BING. Tip 12198: How to remove duplicate points and COGO points from a DWG? Tip 12049: AutoCAD display (status bar) jumps and flickers while zooming. Tip 11511: Assigning elevations to 2D contours (isolines). Tip 10682: Automatic classification of drawing objects by their properties. Tip 10365: Coordinate Tracker vs. Track Coordinates - how to track XYZ in Civil3D? Selected tip: How much more expensive is color plotting compared to black-and-white? How to convert a Tinkercad 3D model to a DWG file? « | » How to apply a changed drawing template (DWT) to existing drawings?